I am fascinated by patterns in nature. From a very early age, I wondered why vegetation grows parallel to landforms, why summer thunderstorms in the mountains occur at the same time every day, and why ripples in sand are so evenly spaced. I knew I would become a scientist, but was not sure in which field. Fortuitously, I took an introductory geology course in my first year in college and realized that this was the science that would give me the tools to pursue my diverse interests. Since that time, I have refined my questions to focus on such things as the alignment of cobbles on a gravel bar, the stacking of channel deposits in a sequence of sedimentary rocks, and the distribution of river valleys dissecting a mountain range. I am most interested in capturing and analyzing the data that describe these patterns and then in interpreting the results with respect to the driving forces and feedbacks that control them. 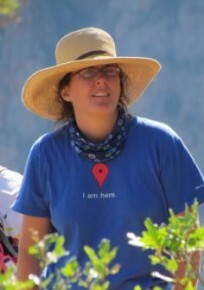 The variability in both temporal and spatial scales over which natural patterns develop means that I get to apply multidisciplinary techniques including GIS, Remote Sensing, and traditional field methods in order to better understand them. The end result is that I continue to expand my understanding of landscape evolution and to add to my mental atlas of how and why nature is organized.